Last year the decision was made to combine the annual RiverFestival and biennial Brisbane Festival to provide Brisbane with one you-beaut three-week artistic and cultural festival of goodness. It was a sensible approach; and gives the newly revamped Brisbane Festival bigger credibility and thus pulling power in the creative world. I believe great artistic festivals are the mark of great cities, and I certainly hope the Brisbane Festival continues to grow. As someone who regularly runs her mouth off about the arts being important, and yet seems to miss generally everything that goes on around town, I've decided to see as many shows as I possibly can at this year's festival. 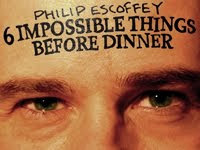 I'm very pleased that my first BF show should be Philip Escoffey's Six Impossible Things Before Dinner. I'm also declaring it the 2009 Brisbane Festival MUST-SEE. Of course, I'm biased - I lived with Philip Escoffey for a week during the 2008 Edinburgh Festival Fringe, and it was there I first saw this brilliant show, which combines psychic marvels, sceptism and charm. If my personal leanings bother you - by all means see the show to prove me wrong. I daresay you'll come out of it as happily baffled as I did last night, and reason that my bias is fairly well-justified. The easiest way to describe what Philip Escoffey does is to say "You know Derren Brown? That English magician/psychic guy? The one who did Russian roulette for real, and just picked the winning lottery numbers? It's stuff like that!" Escoffey states outright that he has no psychic power; but then challenges your own belief in that truth by performing six seemingly impossible feats of prediction/guesswork/magic. To say more would be to spoil the surprises. Just know that your eyes will bulge and jaw will drop on more than one occasion. It's true Derren Brown has cornered the market on glossy, large-scale, psychological illusions. But Escoffey is good up close, working the intimate venue with smiles and flair that can't help sucker you in. It's small scale trickery with big bang impact. Escoffey has in fact written tricks for Brown; but don't expect a similar delivery. Escoffey is much more the sneaky conman than the glitzy showman. It's almost like an hour-long game of three-card monte, and he will beat you. But don't worry - with the show's final revelation, you'll still feel like a winner. Philip Escoffey's Six Impossible Things Before Dinner is being presented as part of The Carnival's Edge program in Southbank's Cultural Forecourt. Apart from QPAC being bastards and charging upwards of $10 for a glass of wine, the temporary circus set-up in Southbank's Cultural Forecourt is remarkably charming, and beautifully positioned under the gorgeous Brisbane Wheel. Tickets $28 adults, $25 concessions or groups of 6 or more. Mr Escoffey is a witch... in the nicest possible way.